* The Congressional Budget Office (CBO) has released their scoring of the Republican AHCA (their Obamacare repeal/replace bill). All of the headlines focus on the big number: 24 million people will lose their health insurance by 2026 as a result of this bill. It would take the total number of non-elderly uninsured back up to 52 million – pretty much where we were prior to Obamacare. * Speaker Paul Ryan issued a statement about the CBO report that tells us a lot about his priorities. Of course Ryan loves the tax cuts for the wealthy and the fact that their plan decimates a fundamental entitlement program (Medicaid). But because of those massive tax cuts for the wealthy, it merely saves $337 billion over 10 years. By 2026, average premiums for single policyholders in the nongroup market under the legislation would be roughly 10 percent lower than under current law, CBO and JCT estimate. For a 64 year-old making $26,500, their premium under this bill would go from $4,900 to $14,600. In other words, they would have to go uninsured. Meanwhile, a 21 year-old with that same income would see their premium drop from $2,450 to $1,450. 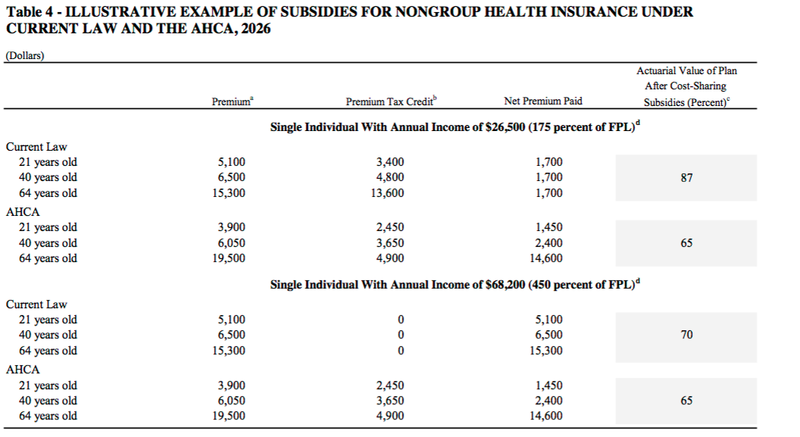 Because of plans’ lower average actuarial values [AHCA eliminates Gold, Silver and Bronze Plan distinctions], CBO and JCT expect that individuals’ cost-sharing payments, including deductibles, in the nongroup market would tend to be higher than those anticipated under current law. In addition, cost-sharing subsidies would be repealed in 2020, significantly increasing out-of-pocket costs for nongroup insurance for many lower-income enrollees. 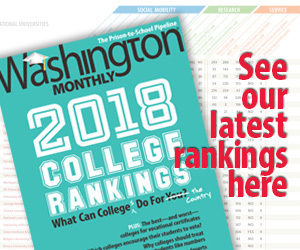 Because of the magnitude of its budgetary effects, this legislation is “major legislation,” as defined in the rules of the House of Representatives. Hence,it triggers the requirement that the cost estimate, to the greatest extent practicable, include the budgetary impact of its macroeconomic effects. However, because of the very short time available to prepare this cost estimate, quantifying and incorporating those macroeconomic effects have not been practicable. In other words, because of the rush to release this report, CBO did not examine the bills effects on other parts of the economy (i.e., jobs). 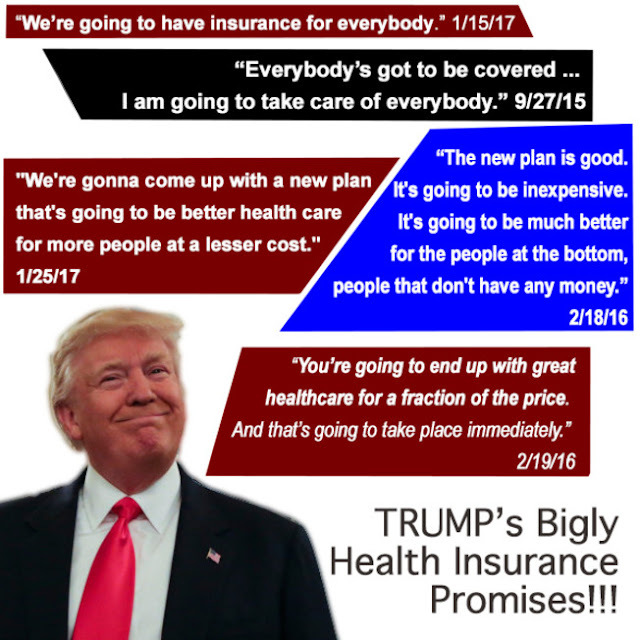 * It is now time to compare what Trump said about his “great” health care plan to what he and Republicans have actually proposed. Here’s a pretty good summary of the former from the folks at TPM.